Fall - Coming to a tree near you. I love traveling, but I love coming home too. Fall is the perfect time to trail ride. Cooler temps, no bugs,& Rocky, ready to go. Apollo is doing great & even leading across the boardwalk. I love the view between Rocky's ears. I'm not the only one thirsty after the ride! we drove through the upper pennisula of Michigan. A really neat place to stop is Porcupine Mountain State Park. and has over 31,000 acres of old growth northern forest. No visit to the "Porkies" is complete until you see the Lake of the Clouds. On our stop, it truly was in the clouds. Our final stop was Pictures Rocks National Lakeshore. towering over the southern shore of Lake Superior. This is Sable Falls tumbling over the sandstone on its way to Lake Superior. The beaches are delightful with all the water sculpted rocks. That concludes a great vacation Up North! until we found Voyageurs National Park. most of the park is made up of water. consists of Rainy, Kabetogama, Namakan, Sand Point & many other smaller lakes. We stayed on the shores of Lake Kabetogama. And camped at the Arrowhead Lodge & Resort. The deer were quite bold and came near our campsite every night. This leopard Frog is right at home in Voyageurs. there are 3 visitor centers in the park. We drove to two of them and also hiked the Blind Ash Bay Trail. we hired the owner of Arrowhead Lodge to take us on a boat tour of the park. built without the use of power tools or equipment. You have to marvel at how he moved the large rocks. The sunset over Lake Kabetogama was beautiful. Voyageurs was a magical place. After visiting Isle Royale, we explored the north shore of Lake Superior in Minnesota. Our first stop was Grand Portage National Monument. the trading post at Lake Superior near the 8.15 mile portage from the Pigeon River. The monument is well worth a visit. There are re-enactors and buildings as they were in the late 1700's. The north shore is characterized by rocky bluffs & cobblestone beaches. There are plenty of hiking trails & skiing hills. These are just a few of the many waterfalls that make up Cascade Falls. View of Grand Marais from the Gunflint Trail. we added Isle Royale to the list on this trip. Isle Royale is an island in Lake Superior accessible only by boat or seaplane. Consequently, it s one of the least visited national parks. We took a 2 hour boat trip to get to the island. The island is 45 miles long & 9 miles wide and the only means of travel is by foot. It is a popular place to backpack. Visitors are allowed to eat as many berries as they want. Blueberies, raspberries & these yummy tart-sweet thimbleberries were all ripe for picking. so we listened to a ranger's talk, walked a nature trail and checked out the backpackers' cabins . Moose & wolves are both present on the island. Moose probably swam from the Canadian mainland 15 miles away. Wolves crossed the frozen lake in the exceptionally cold winter of 1948-1949. We didn't see either of them, but I did see this interesting caterpillar. We also watched a floatplane arrive and drop off backpackers. We enjoyed our day at Isle Royale. Maybe someday we can return for a longer stay. The area near Thunder Bay is also known for its amethyst mines. Several mines allow visitors to stop by and collect specimens. So being a rockhound, I had to stop. you are allowed to pick through the piles of excavated rocks to find the purple gemstones. The Blue Points mine didn't disappoint. I figured we'd be lucky to find one or two pretty rocks. Twenty dollars bought you a bucket of treasure! we watched boats go through the locks at Sault Ste Marie. The barge after the water level is dropped. It can now continue down the Saint Lawrence Seaway. We followed the Circle the Lake tour around Lake Superior. This is Chippewa Falls, the halfway point on the Trans-Canada highway. We visited the town of Wawa, Ontario and saw the Big Goose. We also saw the Gitchee Goomees statues. We checked out the hometown of Winnie-the-Pooh author, A. A. Milne. 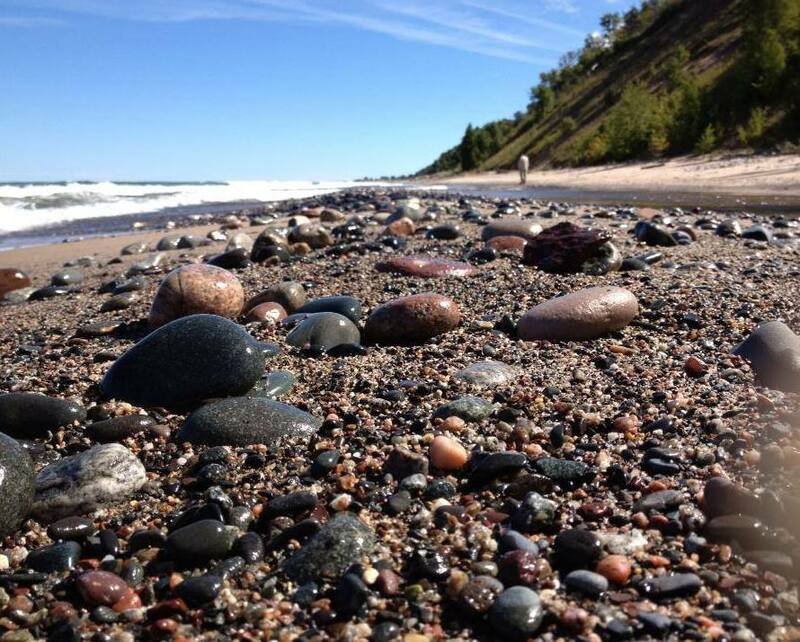 There are lots of beautiful sights along Lake Superior. This is Aguasabon River Gorge, the waterfall is hidden to the left. We stopped at many beachside pullouts. I found the beaches fascinating being made up of tiny red, pink & black pebbles. Near Thunder Bay, we visited the Terry Fox Memorial. embarked on a cross-Canada run to raise awareness of cancer & a cure. forced from his quest by the illness that ultimately ended his life. We camped near White Lake and listened to the call of the loons. Canada is truly beautiful and full of natural wonders.